Galacide, the shoot-em-up puzzler by Puny Human has finally announced the release date of the game onto Steam. Galacide will be launching into Steam Early Access on April 24th. 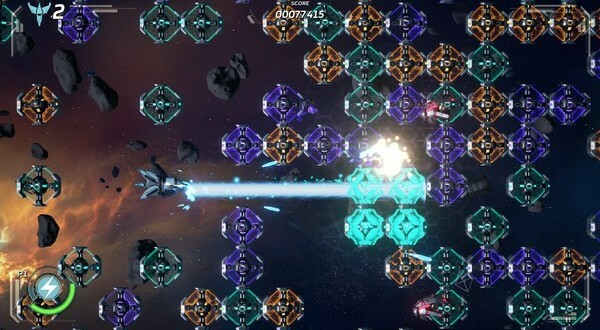 The game is a unique mix of a shmup and a puzzler, and has been described by Puny Human as a Shmuzzle game. The gameplay, which I had a chance to try out at ECGC, is ridiculously fun. I found myself returning to the booth over and over again, and grabbing friends to come check it out as well. 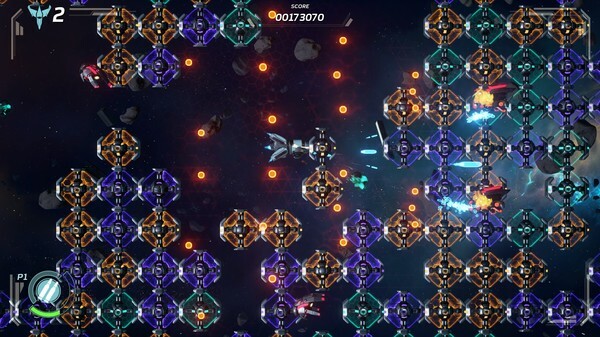 Galacide includes a match-4 mechanic that is often seen in puzzle games and combines this with traditional space shooter gameplay to create a new and innovative experience. The game can be very difficult at times, as the dramatic differences in terms of the shooting and the puzzle solving almost feel like playing two games at once, and it is this challenge that really makes Galacide stand out as a fantastic gameplay experience. The game features two ship types at this time, the mining ship and the freighter. The mining ship is a smaller, more agile ship that allows players to use their tractor beam to pull pieces of scrap towards the ship in order to prevent having to go seek them out in space. The freighter, which I found to be the more entertaining of the two, allows you to store scrap that you can switch between as you desire, which helps if you need that certain color and the enemies just aren’t dropping it. Each ship has the ability to progress in level as the game goes on, and this gives access to better weaponry, and in the freighter’s case you can hold more scrap the higher level you are. These mechanics combine to make an excellent arcade-style experience, and Puny Human have definitely expressed interest in providing a single-player story mode to the game as well, which I think would be extremely interesting. All in all, it is safe to say that any money spent on Galacide is money well spent. Without a doubt, it is one of the most entertaining games that I’ve played this year, and I cannot wait for tomorrow to have a chance to engage in some more shooting and puzzle-solving. Considering the game is only going into Early Access, and Puny Human have already begun working on another ship concept, we can definitely expect good support from them as the project progresses. If Galacide sounds like your cup of tea, then check it out on Steam, and consider grabbing a copy when it releases tomorrow. For a more in-depth impressions, have a look at my preview of Galacide from my time with it at ECGC.